The Lower School has a new spelling champion! 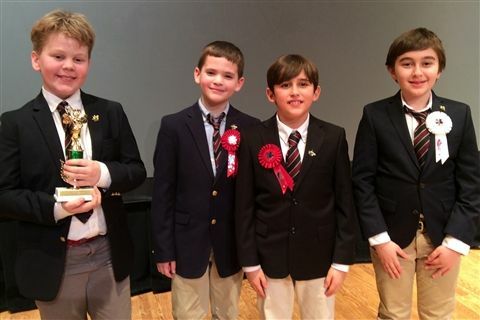 Fourteen fourth and fifth grade boys battled through eight rounds of spelling before a new champion was crowned. Fifth-grader Ian Broihier correctly spelled “prevaricate” to take the crown. Sebastian Perez '26 and Ryan Spacek '27 tied for second place. All of the boys in the Bee impressed the audience with their ability to reel off the spelling of difficult words such as fulcrum, writhing, frippery, and chloroform. Great job and congratulations to all!